CHICAGO – The term ‘serviceable’ gets kind of a bad wrap when it comes to console gaming. Unlike the more wallet-friendly PC or Mobile platform, you’re paying north of sixty dollars for pretty much any new console game. With so many major games being released every year, titles that are just ‘okay’ are generally disregarded. Couple that with a looming cycle of new console hardware, if a development studio isn’t releasing high-profile games like “The Last of Us”, “Grand Theft Auto” or “Call of Duty” they’re probably not gonna make a big enough splash to make any money. Which is a shame because I have mostly benevolent feelings toward “Fuse”, a completely serviceable 3rd person shooter from Insomniac games. The main draw of “Fuse” are the wild weapons. 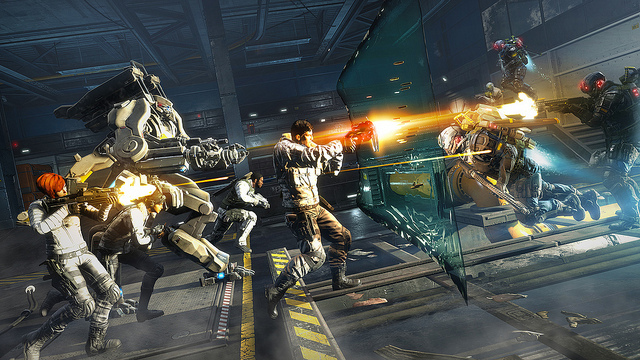 In addition to pistols, shotguns, rifles, SMGs, and Sniper Rifles, each member of your four person team eventually gains possession of a fuse-infused armament. They are a cross-bow that disintegrates enemies called the Arcshot, a high-capacity, black-hole creating ‘warp rifle’, a pistol that doubles as a shield, and a ‘Scatter Gun’ that crystallizes enemies into grotesque abominations of what they once were. I started off using the Arcshot, but after getting bored sniping from afar, I switched over to the character with the “Scatter Gun” and had an absolute ball blasting enemies into millions of little shards. Each weapon is fun to play with, while also serving a particular gameplay style, adding a neat twist to a stale genre. At least I thought it was stale. As someone that’s beaten three “Gears of War” games, three “Mass Effect” games, “Grand Theft Auto IV” and its expansions, “Max Payne 3”, and played many other cover-based games over the course of the past 8 years, I was about ready to write “sllaW hgiH tsehC” over and over again on a Jersey barrier and start jumping around like Daffy Duck on club drugs. However, after drafting a non-gaming friend to play with me, I realized that “Fuse”’s biggest problem is the countless games that came before it. My buddy who had never played “Gears of War” or “Mass Effect” or “Grand Theft Auto”, really really liked this game. She was counting her head-shots, digging the cover system, getting pumped when we fought a giant evil Megatron-esque robot, and during a really trippy, drug-induced, boss-fight, she was faux-screaming, Xena style, as we emptied clip after clip into a giant green Russian’s chest. It was захватывающие. Having someone to play with is probably a necessity for enjoying “Fuse”, namely because playing with a buddy helps you forgive some of the game’s flaws. From a gameplay perspective there isn’t really much to balk at aside from the brain-dead A.I of your partners, who are mostly useless but unobtrusive, except toward the end of the game when they become a flow-breaking distraction, needing to be to revived every time they die, or the game ends. You can upgrade each of these characters with various skills and perks, including larger clip size, the ability to cloak, and a few others, but unless you’re playing as a given character, you don’t really notice any effect. The story feels a bit flat, too. While the idea of DNA-infused weapons is a neat one, the actual plot is generic, with each character having one or two defining traits and a relatively shallow backstory. There are some genuinely entertaining lines and quips from the culturally diverse, but two-dimensional characters, which include a generic big-white tough-guy, an olive-skinned possibly mediterranean English lass, a punk-rock chick with red hair, and a black dude so cool his beard has sideburns. Narrative bright spots included the aforementioned acid-trip boss-fight, the occasional flashback or interactive story sequence, and a final fight against a mech-suit ripped straight out of EXO Squad…in spaaaaaaceeeee! Insomniac Initially positioned “Fuse” as a tongue-in-cheek, “Team Fortress 2”-meets-”Gears of War” kind of adventure, with bright colors, jokes, and over-the-top antics adding flavor to a well-mined, and well-past-tired third person shooter genre. They eventually ditched the style, antics, and bright colors for a more generic tough-guys(and gals)-in-armor attitude - possibly saving all that charm and personality for the upcoming “Sunset Overdrive”. Thus, serviceable. To borrow a quote from Howard Hawks, “A good movie is three good scenes, and no bad scenes” - the same kind of sort of goes for games, too. “Fuse” has quite a few good set-pieces and interesting moments, and the bad stuff is more a problem of genre saturation than it is a failure of development. “Fuse” isn’t going to set the world on fire, especially if you’ve played a lot of what this console generation’s biggest blockbusters have had to offer. You’ll probably find “Fuse” to be competently executed, but mostly derivative experience. But the gameplay is solid, the co-op is захватывающие, and if you’re looking for something to fill the time until “Grand Theft Auto V” releases, “State of Decay” de-glitches itself, or your Xbone pre-order comes in, grab a friend and blast away. And since you know pretty much exactly what you’re getting, you won’t be disappointed. 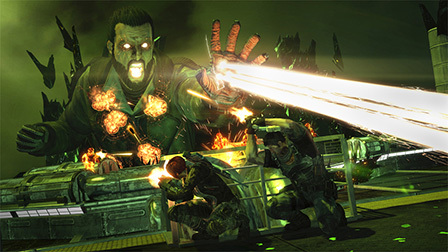 “Fuse” was developed by Insomniac Games and released by Electronic Arts. The version reviewed was for the Xbox 360 but the game is also available for the PS3.